I will admit that over the course of this calendar year I have been one of the ones who have wanted to see three-time Eclipse Award winner Wise Dan do more. I was a little put out that he garnered a clean sweep of the Horse of the Year, Champion Male Turf, and Champion Older Male awards last year, particularly since I thought Breeders’ Cup Turf winner Little Mike more than deserved the Champion Male Turf award. The fact that Lopresti and Fink decided to take the exact same route to the Breeders’ Cup this year as they did last year and admittedly were trying to keep their champion undefeated also left me less than impressed. I wanted to see more. I wanted to see them stretch him out past 9 panels or try marching to victory in a Grade 1 dirt race. It seems as though fans of the “Titan of the Turf” are not likely to see either of those things happen despite what Lopresti and Fink said after the Eclipse Awards ceremony back in January. While I am not thrilled with the fact that they are not challenging him, I think I am pretty well over it at this point. There just doesn’t seem to be any reason for hoping for something that is not going to happen, and at this point, I’m just content to sit back and watch Wise Dan do what Wise Dan does best: rule the turf mile division. Naysayers of the Wiseman’s Ferry gelding doggedly return to the same argument that they used during the mighty Zenyatta’s career: who has he beaten? While it is a valid point, it should in no way or form take away from Wise Dan has done to date. Like Ann and Jerry Moss and trainer John Shirreffs, Charlie Lopresti and Morton Fink have told Wise Dan’s competition exactly when and where the gelding is going to race. There is no guessing involved. No will he or won’t he? It is there in black and white and who chooses to show up to try to defeat the grand gelding is not up to either Wise Dan or his trainer or owner. They should not be berated for who Wise Dan has defeated. If you want to scold someone, scold the connections of the horses that are ducking Wise Dan in favor of an easier spot. With that said, it is hardly surprising that only five showed up to face Wise Dan in today’s G1 Ricoh Woodbine Mile. It is a race that Wise Dan easily won last year and in winning today’s edition, he became the only horse to win the prestigious race twice. Of the field that he faced last year, only Riding the River came back to take another shot this year. Also part of the field were Excaper, Za Approval, Trade Storm, and Dimension. Excaper went immediately to the lead despite hitting the gate, and Dimension went right with him, hounding him through a quick 45:44 half mile. While the two leaders dueled early, an eager Wise Dan with John Velazquez in the irons sat just behind the leaders. Unlike in some of his past races this year, the field in today’s race was strung out over several lengths, so there was no fear of getting trapped on the rail or between horses today. As the field arrived at the top of the stretch, Velazquez tipped Wise Dan to the outside, his cue to go. With no urging from Velazquez, Wise Dan simply inhaled the leaders and drew away to a 3 ½ length win. Za Approval, Trade Strom, Riding the River, Dimension, and Excaper completed the order of finish. Even though Velazquez sat chilly during the entire stretch drive, Wise Dan broke the course record for the mile, stopping the timer in 1.31:75. The final time only tells half the story, though. The ease with which Wise Dan posted that sparkling track record time is the truly spectacular part of the story. He was completely in hand the entire time even though he had always been within two strides of the dueling pacesetters. He was not urged nor all out. In fact, in the winner’s circle, he looked as though he could easily go another circuit and still thump the field. I was actually waiting on him to decide to buck Velazquez right off because he looked so full of himself. Laz, I realize it's just opinion. Many times I don't agree with the year end awards, because as you stated, they're not truly representative of of a particular year, but a life time achievement award that they should have gotten prior. Personally I really don't care about who wins this or that award because it's motivated to generate interest in the sport which is good. I believe even controversy of this kind is good. I've never had anything against any horse, I just don't see how that's possible. For myself and others it's the connections to the horse that elicit emotional responses. I've seen it many times in person, and have seen it stated on this and other sites, both pro and con. My gripe about WD is the owner doesn't need the money, has potentially one the best grass horses in history, possibly dirt as well, and won't let him race with the best by adding the variety the trainer has all but begged him to let him do. Have a good night. Icy, that should have been 2010, not 2009. Icy, year-end awards are difficult to comprehend at times. For instance should Zenyatta have been HOY in 2009 or Blame? Should she have been HOY in 2008 or Curlin? Going back to 1953 Native Dancer won 9 or 10 including 2/3rds of the TC (losing that Derby by a head when having a trough trip), and yet lost HOY to Tom Fool who went a perfect 10 for 10 including NYRA’s handicap triple. To compensate (at least I think that that’s what the total voters were doing), Native Dancer was HOY and Top Male Handicap Horse in 1954 based on a three race campaign which included the Met Mile, a minor handicap and an allowance win. The top three year old that year, High Gun, was passed over in spite of winning the Peter Pan, Dwyer and Belmont against three year olds and the JCGC, Manhattan and Sysonby against older horses. Dr. Fager was top turf horse in 1968 based on a single turf race (win) and top sprinter based on two sprint wins, one in a minor stake. Some of the awards don’t sit right and to me at times the voters are voting for who they think was the better horse, and not based on their true seasonal records in the years they received an award. Laz, after reading your comment, I couldn't agree more. I do however think Fort Larned should have gotten American Older Horse for his exploits on dirt in 2012, which is nothing knew I guess, as this has been my position all along. Of all the races run in America 80% to 90% are run on dirt. To put it in perspective, take away dirt racing in North America and all the tracks will close, permanently, now. The fact they're going to anyway shouldn't stop us from making an effort to extend their life though by acknowledging the best horse to run on the preferred surface of the American people, dirt, just one time, in one particular year, where Fort Larned ran farther and faster than anyone for the average American fan on their preferred surface. Of course then there's the Morton Fink fan philosophy which is , "let them eat dirt and like it." I don't like it Laz, but that's a personal choice isn't it. LAZ, Another great post, love Dan, love the details. Combined beaten lengths doesn’t do a lot for me, tho :) Love Frankel and Goldikova, too. Fort Larned won exactly two G1 races last year, the BCC and the Whitney. He also lost two G1’s while winning a G2 and winning and losing a G3. You can also throw in a 4th in an allowance race at of all places, Tampa, while he came back and won a 60K stakes there. Most of the horses that he defeated also finished ahead of him last year. His record was a not too impressive 9-5-1-1 with two out of the money finishes. In spite of the BCC victory, some feel that he should have been HOY. Really? Then why not past BCC winners like Volponi and Cat Thief? The combined losing distance in his four losses was 22 ½ lengths……Game On Dude had a good year in spite of what some might think of his competition in those races in California. The old saying is, you can only race against whoever shows up. Still, GOD didn’t deserve HOY IMO. He ran 8 times with a record of 8-5-1-0 and two times out of the money, ironically in races that if he would have won just one of them might have been enough to get him HOY. He also only had two G1 wins with two G2’s and a G3. Simply put, he lost to Fort Larned on his home track in his biggest race of the year and as a 6-5 favorite. And the horse that finished second in the BCC has never won a G1 race.……Like it or not, Wise Dan was HOY and IMO deservedly so. He won three G 1’s and finished 2nd by a head in another, because he was surprised, not because he wasn’t good enough, and ironically in a race where Fort Larned finished a struggling 8th. He also won a G2 and a G3 and split two 9F races, winning on synthetics when running the 9F in 1.46 3/5 and winning by 10 lengths, and losing by that head on dirt. He won on four different turf courses, won a Breeders Cup race, won on two of the three different race type surfaces and lost by a head on the other, defeated top foreign competition twice, and for what it’s worth Beyered 100 or more in every one of his races, another area where Fort Larned struggled as he managed a 100 Beyer or more in only 4 of 7 races. Wise Dan’s record of 6-5-1-0 includes zero out of the money finishes and the total distance of his defeats measured a paltry head. Whether he stuck to his favorite distance in most of his races or not, the fact is that when he did face others on their favorite surface and at a distance favorable to them his came with in a surprise head defeat of victory. He is also the only one horse from N/A that truly is a major consideration world-wide. Icy 2 Grade 1 wins and 4 losses for Fort Larned wouldn't win too many Horse of the Year awards in the past. I do think he should have been Champion Older male though and you probably don't really want a picture of me anyway. Actually sometimes mathematics can be deceiving. That's why on another thread I asked Tmallios for an explanation of his "dead rail" comment regarding Parx as I like the #2 horse in the Penn Derby and statistics don't show that "dead rail" to be true. As for FL thoughout the year 2012 he ran successfully with the best available horses. That's all one can ask of a horse, or any other athelete, in any other field. Wise Dan won 3 Eclipse Awards last year because the older main track horses and 3 year olds turned in sub par campaignes. It will take the same thing happening this year for him to repeat his success. If Game on Dude wins the Classic he will be Horse of the Year and Older Male. If Orb or Palice Malace wins the Jockey Club Gold Cup and the Classic they will be Horse of the Year. Wise Dan is a great horse, the best American turf miler I have ever seen, but a lot of his dominance of the American racing scene has been because of less than dominate proformances in the glamour divisions of racing, the older male handicap division and 3 year old males. 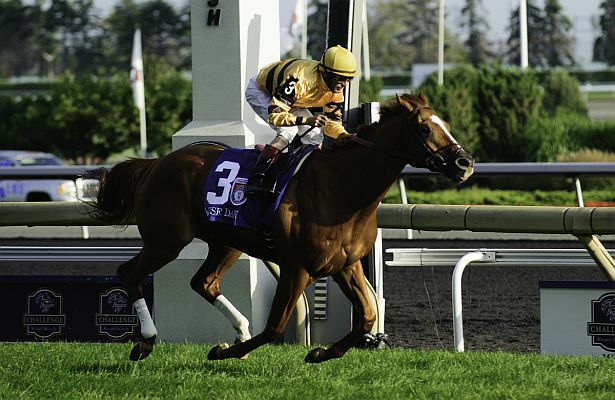 Personally, I would really like to see an Obviously/Wise Dan match-up prior to the Breeders' Cup. has not Frankel hung up his cleats?? Decent group one animal, but I'm afraid Frankel is "Titan of the turf". Can't wait for breeders cup. 108 BSF for Wise Dan in the Woodbine Mile. I understand the arguments, especially in reference to the past legends stepping out of their comfort zones. However, as I said, I'm past it. I'm content to sit back, relax, and watch him do his thing. Wise Dan travels from track to track and bascially has no home track or home circuit, which is not something that you can say about all horses. He smashed the course record today and has won 9 graded stakes in a row, six of them G1s. I don't get the arguments that he needs to do more.